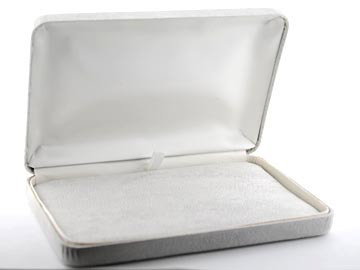 Deluxe suede double ring box. Platinum (light grey) in color. Size: 2 3/8" x 2" x 1 1/2". Supplied with two piece outer packer box. 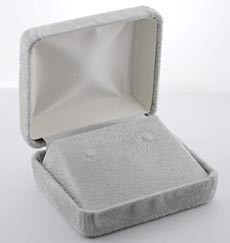 Deluxe suede small earring box. Platinum (light grey) in color. Size: 1 7/8" x 2 1/8" x 1 1/2". Supplied with two piece outer packer box. 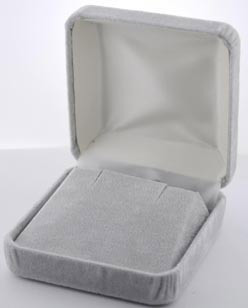 Deluxe suede pearl box. Platinum (light grey) in color. Size: 6" x 4 " x 1". Supplied with two piece outer packer box. 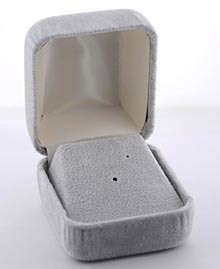 Deluxe suede flap earring box. Platinum (light grey) in color. Size: 2 3/4" x 2 3/4" x 1 1/2". Supplied with two piece outer packer box. 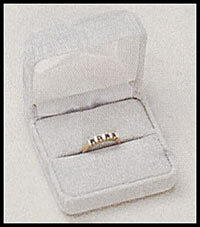 Deluxe suede single ring box. Platinum (light grey) in color. Size: 1 7/8" x 2 1/8" x 1 1/2". Supplied with two piece outer packer box.